For the first time in nearly 100 years, a total solar eclipse will be seen from coast to coast, from the Pacific to Atlantic Oceans this summer. Here's where you can see it in Iowa. August 21 is the day of the first total solar eclipse seen in any of the contiguous 48 states in nearly 20 years. More on that later. On that day, most of Iowa will only see a partial eclipse of the sun, including here in Cedar Rapids. According to Time and Date, the partial eclipse will start around 11:45 in Cedar Rapids and continue until 2:36. It will only be partial, though, meaning at least some of the sun will be visible throughout. If you want to see the total solar eclipse in Iowa, you'll have to drive to Hamburg, in the extreme southwestern part of the state. Hamburg is about a four-and-a-half hour drive from Cedar Rapids. 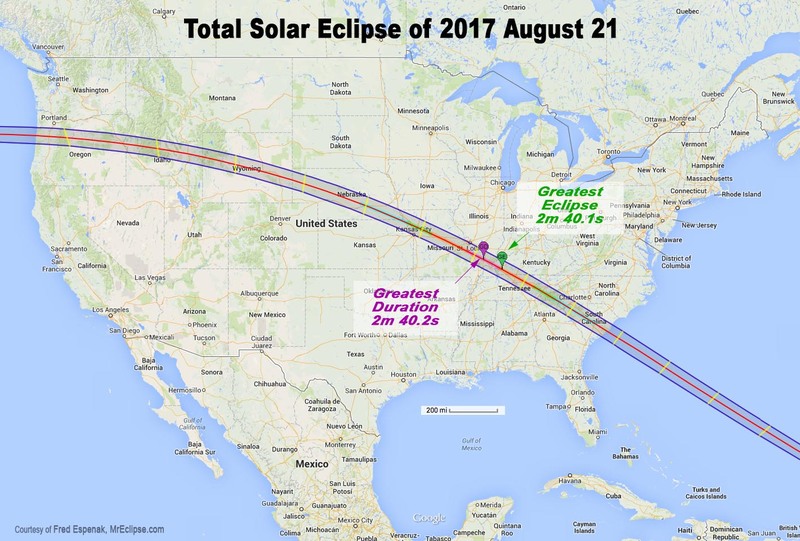 It made Time Inc's list of "25 Perfect Spots for Watching the Total Solar Eclipse in August." You want to be in the Lower Hamburg Bend Wildlife Management, just southwest of town. Why? That's because only a very small area in Iowa will actually see the total eclipse. Don't be late, either. The TOTAL eclipse at Hamburg will last a whopping 26 seconds, beginning (and ending) at 1:05 the afternoon of August 21. Yes, 26 seconds. The civic boosters of Hopkinsville, Kentucky cite their fair city as the best spot in the nation for the eclipse." There will be plenty of great choices throughout that belt that curves its way through the country, but you know there's gonna be one heck of a party in Hopkinsville. It is never safe to look at a partial or annular eclipse, or the partial phases of a total solar eclipse, without the proper equipment and techniques. Even when 99% of the Sun's surface (the photosphere) is obscured during the partial phases of a solar eclipse, the remaining crescent Sun is still intense enough to cause a retinal burn, even though illumination levels are comparable to twilight. Failure to use proper observing methods may result in permanent eye damage or severe visual loss. This can have important adverse effects on career choices and earning potential, since it has been shown that most individuals who sustain eclipse-related eye injuries are children and young adults." June 8, 1918 was the last time there was a total solar eclipse from coast to coast. August 21 should be quite a day. Here's hoping for a clear one across much of the U.S. and safe travels if you're hitting the road to see it in person. It's too bad most Iowans won't get the full effect, in person.